After three or four winters here now, I've been really trying to come to grips with accurately predicting and preparing for my firewood needs. 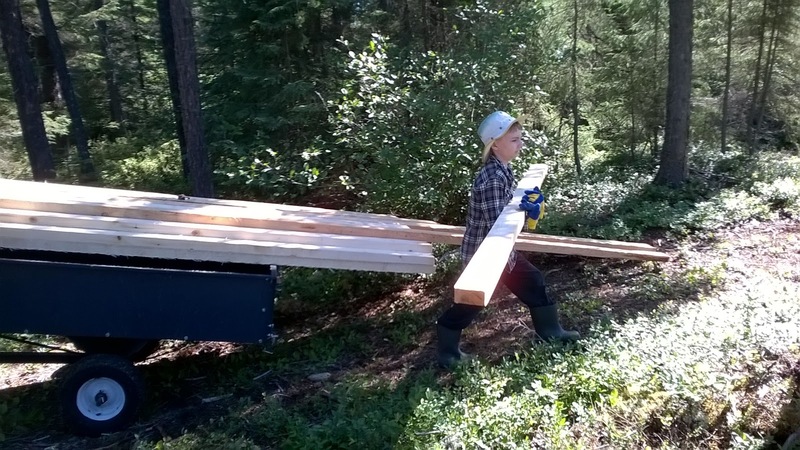 Of course, a guiding principle is to try to reduce the amount wood I need to cut each year first - but after that, I also want to ensure that I've put up enough dry wood to account for unforeseen challenges. Each year we have managed to improve our comfort levels. We burned far more than I expected in the yurts - I predicted that with such a small space, it would be easy to heat. I far underestimated how poor our stove was, and how a thin layer of insulation didn't hold heat for long once the stove went out. Last year was the first year that I didn't have to go out seeking extra wood in the spring after burning through all of our stores. It was also a warmer winter than usual - in that respect we were pretty blessed. The past three winters we have concentrated on filling the four wood "shelters" that I constructed before our second winter here. They were based on a rather simple design that I liked quite a bit at the time - but since then I have decided that they were too scattered, and too short. I can't tell how many times I have banged my head on the "ceiling" in them - they are about 6' in front, but taper down to under 5' by the back. They also are in a number of different locations around the cabin, so as the winter goes on, when one empties, we have to blaze an entirely new trail through the snow to begin raiding the next shelter. Not a huge deal, but an annoyance nonetheless. So with that in mind, I began plotting out a new, centralized woodshed. Previously at one of my clients I had noted an open sided shelter as their wood storage. It was basically a wide roof on posts packed solid with birch underneath. I was crazy jealous - that was what I wanted to have for myself. As far as locating it, I wanted it to be behind the cabin where it wouldn't be a visual distraction to people arriving at the homestead. Another consideration I had was that I wanted it to fit in with the styling of the homestead - the garage was a bit more of a traditional departure, but I acknowledge that it was an experiment and was designed to be fast to build, and built farther from the main living space of the homestead. This time I wanted to return to the steep pitched roof, with a wraparound porch. Transporting my lumber to the work site. Donna dismantled the sides of the old shelter to make way for the new. All great constructions had to start with the first cut. Here is where I am adding my own twist on things in a few new "innovations" (at least to me). So far I have constructed normal stick walls. They are eight feet tall, but nine feet wide. Using my first wall as a template for all the remaining ones. I placed the studs at approximately eighteen inch centres. Then I used fence wire in three foot wide rolls to cover them. With the nine foot width, I was able to cover the walls in exactly three strips of fence stapled vertically. I purchased one hundred feet of fence. Three eight foot strips per side gives me twenty-four feet of fence per side. Times four comes out to be ninety-six feet needed in total - so my hundred foot roll worked out with very little excess. Kenny and Mama pitched right in and helped unload the remaining lumber! On one wall I left out the third stud from a corner to open up a three foot door. I did drop a "header" down a foot from the top edge of this wall, just to make it not feel quite so high. I cut and fastened the fencing around this opening as well. A good opportunity to clear some brush. A nice stack of walls, note the door opening. Stop to enjoy the sunrise. Grandpa dropped by and helped me heave the walls up into place and fasten them together. We leveled the corners, but I still want to place more supports in the centres of each wall to prevent them from sagging too much over time. An extra large pallet will make a lovely floor! Grandpa pitches in to unload the "floor". Nestled behind some alder bushes. I added some "rafters" to hold the walls together. At first I was going to put the gable end of the woodshed towards the door, as this felt natural. 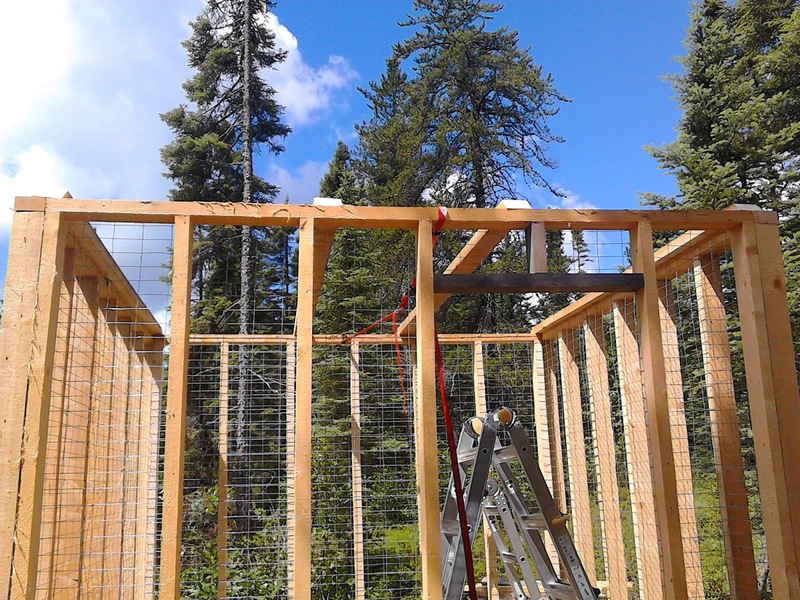 I have since changed my mind on this - we opted to fasten the "side" walls to the outside of the "front" and "back" walls, so the woodshed is eight inches wider than it is deep. While measuring my choice lumber for rafters, I realized that it would be a few inches too short to span the width, but just fine for the length. And that's the story of how the roof rotated ninety degrees. It has the downside of probably causing more snow to be shed in front of the door - I can maybe mitigate that with some snow break or some sort of prow to direct snow away from that side... Or maybe we'll just grin and bear it, and climb over, or shovel any snow that falls on the path. It does have the upside of exposing the gable end towards the cabin. This has put me in mind of the option to run a normal clothes line from the cabin to the peak of the woodshed someday if we decide it would be of use. Rafters beveled and fastened in place. Note the bevels face the entrance. Using a ratchet strap to ensure the tops of the walls are tight. 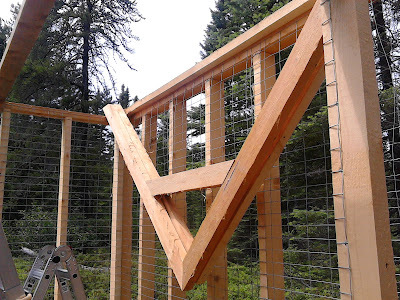 I built four trusses. 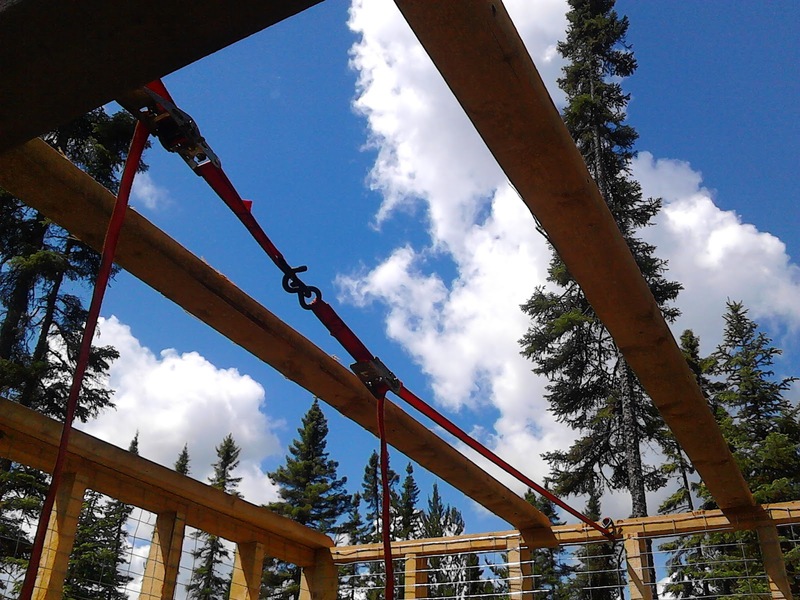 I feel that three foot spans between trusses is acceptable for this particular construction. I will be strapping it before installing the steel, so there seems to me to be plenty of support for such a light load. 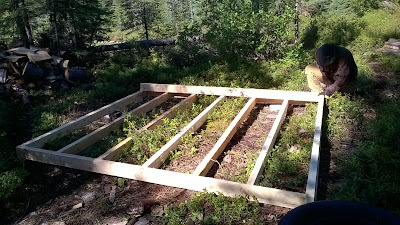 On my lean-to type wood shelters, I actually only fastened the steel at the edges and it supported full snow loads all winter without any signs of buckling or permanent distortion. Two rafters at this end. 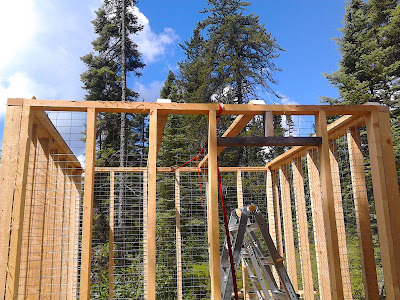 In the next day or two hopefully with help I can flip the trusses up and screw them to the top of the walls. Then with a few straps they should be nice and stable. And two more at this end. This will create the enclosed space for my dry "to-burn" wood - is encloses pretty much 512 cubic feet, or six cords of wood. Grandpa estimates that this should be more than enough for our 630 square foot cabin. Now the part that I'm really thinking is cool is that I still plan on adding a "wraparound porch" or sheltered area around the entire perimeter of this building. This time though I don't plan on adding support posts on the outside edge of this porch. Instead of it being between five and six feet out from the walls of the main building, it will only be about four feet. As such, I'll probably just fasten rafters directly to my inner walls. With this "lean-to" or porch all the way around my inner building, I will be able to pile one or two rows of wood outside the inner building as well. I am planning on piling my greener wood there, on the outside, where it is more exposed to the sun and wind (and even rain and snow). My thinking is that it will protect the inner woodshed from moisture, while still allowing it to breathe. The fencing will help to support the inside and outside piles when they are not of equal heights, as well as to clearly mark off the wood we are currently burning vs the wood that is still drying. Each wall on the outside should be able to shelter an additional three cords of wood (piled eight feet high - I'm not sure that that is very realistic) for a total of 12 more cords of wood (minus some for the door opening) in the "bullpen" ready to move inside. 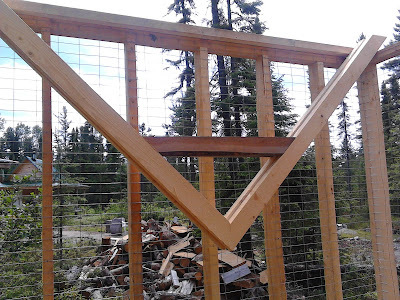 So my overall plan then is that in the spring or summer or whenever we finally empty the inner woodshed, we will simply move a bunch of wood from the outside zone to the inside zone. It shouldn't be difficult. I am even looking forward to the first time when this happens - it will be a bit like being in a cordwood building - the outside walls will all be piled wood beyond the fence - cool! Oh, I also want to point out that this project will be built without any commercial lumber. Everything here should be milled from my own trees. I also am making this with true two inch by four inch boards. They are quite a bit more substantial than what is normally sold in stores. I'll try to keep you posted as it progresses.